The Holdridge’s toad is a small, black, deaf and mute toad that lived in Heredia’s Chompipe Mountain Range. After searching for the species with no luck, Barcelona’s Red List of Endangered Species, from the International Union for the Conservation of Nature (IUCN) declared the small toad extinct from the globe. Holdridge’s toad, whose scientific name is Incilius holdridgei, used to be a very prevalent toad in Costa Rica’s Heredia highlands.”Holdridge’s toad was a species endemic to the Central Mountain Range – at an average altitude of 2,270 meters (7,448 feet) above sea level,” Alan Pounds, renowned herpetologist for the Puntarenas Tropical Science Center, said. The species had only been seen before on Costa Rica Land, and since it has not been seen here since 1986, it was finally declared extinct. According to Gerardo Chaves, scientist for the University of Costa Rica and coauthor of a national report that helped declare the species extinct, Holdridge’s toad was known for its rugged, bumpy skin, easily identified by its bright orange and black markings. “This frog was rather small and measured five centimeters in length, about three centimeters less than another other species of common toad,” Chaves explained. In addition, they were deaf and mute, a very strange trait among frogs. Unlike most species, they did not communicate through noise, which means that they emitted no call or song. According to experts, this only makes sense in the species developed in an area with so much noise that other forms of communication were necessary. Mysteriously, the Chompipe Mountain environment is not loud, and is the only area where these toads were ever found. Chaves added that the toad was very easy to spot during its April/May mating season – for the rest of the year, it was nearly impossible to find. “This species had a very interesting behavior. During mating season the frogs would meet up near the main street that goes toward Chompipe Mountain. There they formed hundreds of very impressive looking groups. There were many male toads waiting for their females… just imagine, [at that time] there were so many of them that the Holdridge’s toads would grab onto other species to [mate] with them.” Unfortunately however, this mating frenzy has not been witnessed since before 1986, more than 22 years ago. Costa Rican scientists and experts from the IUCN believe that habitat reduction and climate change are the principal factors responsible for the species’ extinction. Most specifically, a chytrid fungus has been attacking Central America’s frog species, which essentially suffocates frogs with its growth. Frog populations have dwindled dangerously, and many species have all but disappeared from Costa Rica’s rain forests. Among them, the harlequin toad and the golden toad, two species now believed to be extinct. Holdridge’s toad was put on the Red List of Endangered Species in 2006, but scientists held out hope for its rediscovery. Many teams headed out into the field to look for it, though obviously, none was successful. “From a biological point of view, the fact that a species goes extinct is not a strange thought, it’s almost a law of nature. That said, as a person and scientist in the field, one feels a tremendous impotence when he sees such an abundant species disappear before his eyes. You feel really bad,” Chaves concluded. Costa Rica’s Harlequin Frog, once thought extict, florishes on the Rainmaker Reserve. It has been suspected for some time that global warming may cause widespread amphibian extinctions. 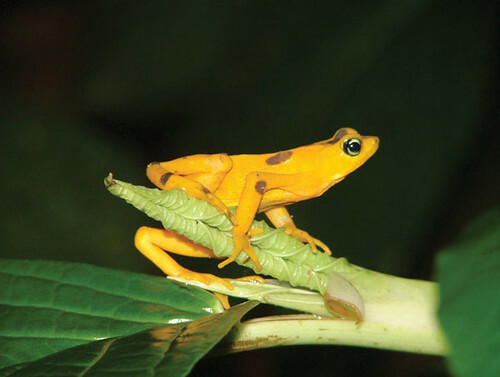 In a study published in 2006 by J. Alan Pounds suggested that many harlequin frog species (Atelopus) across Central and South America have disappeared due to deadly infectious diseases spurred by changing water and air temperatures. At one time the Harlequin Frog (actually a toad) was thought to be extinct. In 2003 the Harlequin Frog was rediscovered in the primary rain forest of the Rainmaker Reserve on the Central Pacific Coast of Costa Rica. “Disease is the bullet killing frogs, but climate change is pulling the trigger,” said Pounds, lead study author and resident scientist at Costa Rica’s Monteverde Cloud Forest Preserve. The World Conservation Union (IUCN) has listed this frog as Critically Endangered and facing an extremely high risk of extinction in the wild, because most of them have disappeared since 1988. In 1996, in fact, scientists feared that all of the more than one hundred populations known to exist in Costa Rica were already gone. Seven years later, however, a tiny population was discovered at Rainmaker Reserve. About two-thirds of the 110 known harlequin frog species are believed to have vanished during the 1980s and 1990s. The primary culprit, Pounds suggests, is the disease-causing chytrid fungus Batrachochytrium dendrobatidis. Amphibian skin is extremely thin, which makes frogs acutely sensitive to even minor changes in temperature, humidity, and air or water quality. It also makes frogs more susceptible to chytrid fungus. The new study suggests that temperature extremes may have previously helped keep the deadly disease in check. But new climate cycles are now moderating those annual temperature swings. Global warming has increased evaporation in the tropical mountains of the Americas, which in turn has promoted cloud formation, the study reports. That cloud cover may have actually decreased daytime temperatures by blocking sunlight. At the same time, it may have served as an insulating blanket to raise nighttime highs. Pounds believes the combination has created ideal conditions for the spread of the frog-killing fungus, which grows and reproduces best at temperatures between 63° and 77°F (17° and 25°C). Related Article about Rainmaker Reserve. What is Carbon Sequestration? What are Carbon Sinks? Why are they important?